If you love a celebration and are looking for something to celebrate, the website, http://www.holidayinsights.com/moreholidays/, is a great help. Here bizarre, unique and different days are listed so that everyday can be a celebration. For example, on 22 February you are not allowed to talk about your success or accomplishments as it is ‘Be Humble Day’. ‘No Diet Day’ is celebrated on 6 May where people are encouraged to accept their bodies, while International Joke Day is scheduled for 1 July when telling a joke is appropriate throughout the day no matter where you are. 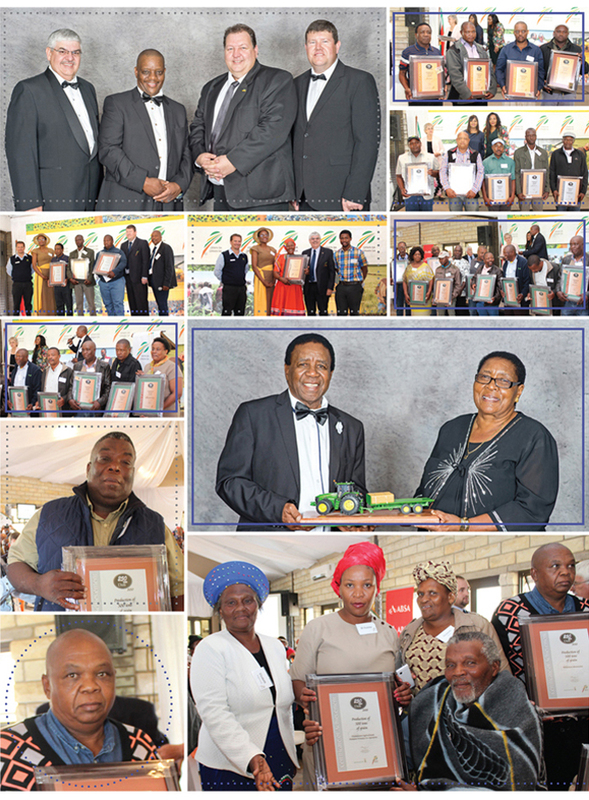 Grain SA’s Farmer Development Programme added their own special day in 2009 – the Day of Celebration. On this day the achievements of the farmers who are part of this programme is celebrated. During the event acknowledgement is given to farmers for the arduous work they put in throughout the year. Whether the year has been challenging with low yields realised or a good rain season has produced record high yields, the festivity takes places as a celebration and overshadows any of the trials that the farmers were faced with during the year to reach the end of the production season. This day also gives the farmers and the Grain SA team – management, mentors and provincial co-ordinators – an opportunity to relax at a beautiful venue and compare notes about the past season. On 5 October 2017 more than 300 guests which included government representatives, agricultural stakeholders and approximately 150 emerging grain producers, many sporting colourful traditional outfits, attended the 2017 Day of Celebration. 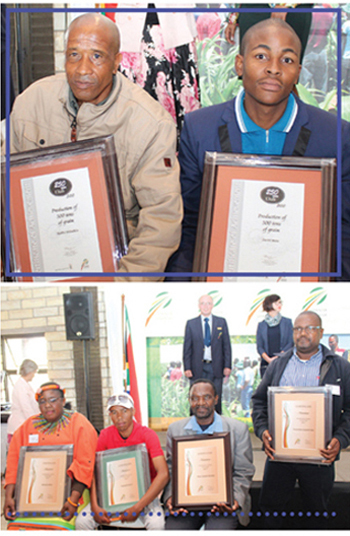 This year the farmers’ progress and hard work were acknowledged at the Sandstone Sleeper Estate on the outskirts of Bloemfontein. With 17 new farmers joining the 250 Ton Club and 21 becoming members of the 500 Ton Club, it was clear that the valued advice Grain SA’s team and mentors share with the emerging farmers is making an impact in the lives of developing farmers. The main sponsors of this wonderful occa­sion were represented by Dr Langa Simela (Business Development Manager: Absa AgriBusiness), Mr Ferdie Marx (Area Alliance Manager: John Deere Financial sub-Saharan Africa), Linda van der Merwe (Head: Customer Marketing, Syngenta SA) and Dudu Mashile (Sales Manager: Emerging Markets, Monsanto). As the end of the formalities Jane McPherson­ (manager: Farmer Development, Grain SA) thanked the friends of the programme – those individuals who support the programme to ensure its continued existence. These include the Maize Trust, Winter Cereal Trust, OPOT, Monsanto, Afgri, Pioneer, Pannar and Sasol Base Chemicals. Jannie de Villiers (Grain SA CEO) expressed his gratitude to every developing grain farmer who is willing to be mentored and taught, thereby ensuring a growing harvest of grain farmers each year. As most winners know, there is no secret recipe for success. It is the result of hard work, dedication and determination as the following four 2017 category winners learned. The 2017 Grain SA/Absa/John Deere Financial New Era Commercial Farmer of the Year was presented to Edwin Thulo Mahlatsi from Bothaville in the Free State at the prestige function at The Theatre on the Track in Midrand on Friday, 13 October last year. As the winner, he received a brand-new John Deere 5065 MFWD OOS tractor sponsored by John Deere Financial. Edwin is a grain producer on the farm Swartlaagte which he obtained through the government’s PLAS programme. This year he yielded a substantial 5 and half tons/ha. The other finalists in this category were Remember Mthethwa from Dundee and Lolwane Vuyani from Lichtenburg. (Read more about Edwin in the February issue of Pula Imvula.). A new category, Grain SA/Monsanto Potential Commercial Farmer of the Year, was introduced this year for farmers with access to more than 100 hectares of arable land, but who are currently not able to use all of the available land but are able to become 250 Ton New Era Commercial farmers. The winner of this new category, Paul Malindi, from Edenville in the Free State, says agriculture is in his blood. He was granted the use of this 441 ha farm through the government’s PLAS programme in 2012 and joined Grain SA’s Farmer Development Programme the same year. Paul is one of the founding members of the Edenville Study Group. The fact that he implemented all the advice he has been receiving over the years, paid off this year. The other finalists were also both from the Free State, Daniel Tshidiso and Ruben Mtlhanbae. Thembalihle Hopewell Tobo, the winner of the Grain SA/Syngenta Smallholder Farmer of the Year 2017, hails from Ndunge near Bizana in the Eastern Cape. He started farming in 1996, became a member of Grain SA in 2006 and is currently the chairperson of the Ndunge Study Group. Tobo harvested more than 5 tons/ha on his 15 hectares of maize. Apart from the maize component, he also has a soya milk value-adding enterprise which is steadily growing. He is a dedicated farmer who is seen as a role-model in his community. Meluxolo Mfoxo from KwaZulu-Natal and Samson Shuwisa from Mpumalanga were the other two finalists in this category. 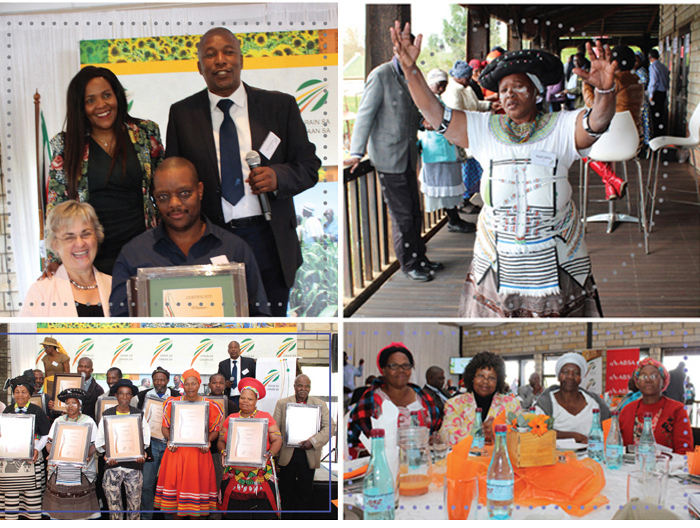 The 2017 Grain SA/Absa Subsistence Farmer of the Year, Mavis Hlatshwayo (55) joined Grain SA in 2005 and is mentored by Jerry Mthombothi (developing co-ordinator). She dreams of owning more land to create job opportunities for the unemployed in her community. Mavis is always willing to share the knowledge she gains at the study group meetings, workshops and courses arranged by Grain SA with less experienced farmers in the area. The other finalists in this category were Elliot Siphowe Gumbi from KwaZulu-Natal and Solomon Ghasa Dhlongolo who hails from Mpumalanga. Every morning in Africa, a gazelle wakes up, it knows it must outrun the fastest lion or it will be killed. Every morning in Africa, a lion wakes up. It knows it must run faster than the slowest gazelle, or it will starve. It doesn't matter whether you're the lion or the gazelle; when the sun rises, you'd better be running. Although the origin of this proverb is debatable, the meaning is very relevant. Farmers, don’t just dream of being the next winner, wake up and work hard at it – you may just be one of the stars of the 2018 Day of Celebration.